Visiting Los Lagos Hot Springs and Paradise Hot Springs will get you outdoors. 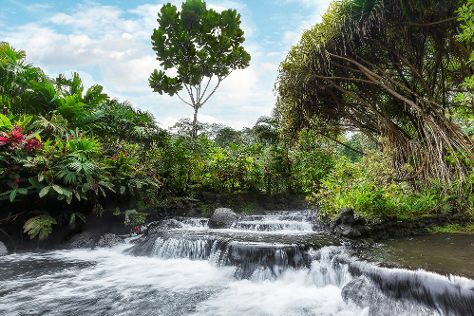 You'll discover tucked-away gems like Arenal Natura Ecological Park and Onirica Art Gallery. The adventure continues: take in the natural beauty of Tabacon Hot Springs, contemplate the geological forces at Cerro Chato (Chato Volcano), stroll through Ecocentro Danaus, and get a new perspective on things with Boat Tours & Water Sports. For maps, more things to do, and other tourist information, go to the La Fortuna de San Carlos sightseeing app . San Francisco, USA to La Fortuna de San Carlos is an approximately 14.5-hour combination of flight and shuttle. You can also do a combination of train, flight, and shuttle; or drive. You'll lose 2 hours traveling from San Francisco to La Fortuna de San Carlos due to the time zone difference. Wrap up your sightseeing on the 11th (Sun) to allow time to travel to Manuel Antonio. Start off your visit on the 12th (Mon): stop by Meli Melo Boutique and then kick back and relax at Playa Manuel Antonio. To find ratings, reviews, maps, and tourist information, read our Manuel Antonio road trip planning tool . Traveling by combination of taxi and flight from La Fortuna de San Carlos to Manuel Antonio takes 1.5 hours. Alternatively, you can drive; or take a shuttle. In March in Manuel Antonio, expect temperatures between 80°F during the day and 66°F at night. Finish your sightseeing early on the 12th (Mon) so you can travel to San Jose. For where to stay, more things to do, photos, and more tourist information, use the San Jose trip itinerary tool . Traveling by combination of taxi, flight, and bus from Manuel Antonio to San Jose takes 1.5 hours. Alternatively, you can drive; or take a bus. In March, plan for daily highs up to 80°F, and evening lows to 66°F. On the 13th (Tue), wrap the sightseeing up by early afternoon so you can travel back home.